Air is a mixture of several gases. When completely dry, it is about 78% nitrogen and 21% oxygen. The remaining 1% is other gases such as argon, carbon dioxide, neon, helium, and others. However, in nature, air is never completely dry. It always contains some water vapor in amounts varying from almost none to 5% by volume. As water vapor content increases, the other gases decrease proportionately. The atmosphere is classified into layers, or spheres, by characteristics exhibited in these layers. The troposphere is the layer from the surface to an average altitude of about 7 mi. It is characterized by an overall decrease of temperature with increasing altitude. The height of the troposphere varies with latitude and seasons. It slopes from about 20,000 ft over the poles to about 65,000 ft over the equator; and it is higher in summer than in winter. At the top of the troposphere is the tropopause , a very thin layer marking the boundary between the troposphere and the layer above. A relationship between the height of the tropopause and certain weather phenomena has been documented. Above the tropopause is the stratosphere . 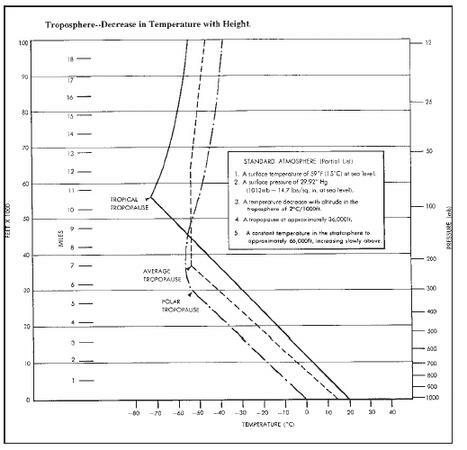 This layer is typified by relatively small changes in temperature with height except for a warming trend near the top. Air is matter and has weight. Since it is gaseous, it is compressible. Pressure the atmosphere exerts on the surface is the result of the weight of the air above. Thus, air near the surface is much more dense than air at high altitudes. Two commonly used temperature scales are Celsius (°C), or centigrade, and Fahrenheit (°F). The Celsius scale is used exclusively for upper air temperatures and is rapidly becoming the world standard for surface temperatures also. Traditionally, two common temperature references are the melting point of pure ice and the boiling point of pure water at sea level. The melting point of ice is 32°F (0°C); the boiling point of water is 212°F (100°C). Thus, the difference between melting and boiling is 100°C, or 180°F; the ratio between degrees Celsius and Fahrenheit is 100/180 or 5/9. Since 0°F is 32°F colder than 0°C, you must apply this difference when comparing temperatures on the two scales. You can convert from one scale to the other using one of the following formulae: C = 5/9 (F − 32) or F = 9/5 C + 32 where C is degrees Celsius and F is degrees Fahrenheit. Heat is a form of energy. When a substance contains heat, it exhibits the property that is measured as temperature—the degree of "hotness" or "coldness." A specific amount of heat absorbed by or removed from a substance raises or lowers its temperature a definite amount. However, the amount of temperature change depends on characteristics of the substance. Each substance has its unique temperature change for the specific change in heat. For example, if a land surface and a water surface have the same temperature and an equal amount of heat is added, the land surface becomes hotter than the water surface. Conversely, with equal heat loss, the land becomes colder than the water. The Earth receives energy from the Sun in the form of solar radiation. Earth and its atmosphere reflect about 55% of the radiation and absorb the remaining 45%, converting it to heat. The Earth, in turn, radiates energy, and this outgoing radiation is terrestrial radiation. It is evident that the average heat gained from incoming solar radiation must equal heat lost through terrestrial radiation in order to keep the Earth from getting progressively hotter or colder. However, this balance is worldwide; regional and local imbalances that create temperature variations should also be considered. also vary with differences in topographical surface and with altitude. These temperature variations create forces that drive the atmosphere in its endless motions. Diurnal variation is the change in temperature from day to night brought about by the daily rotation of the Earth. Earth receives heat during the day from solar radiation but continually loses heat by terrestrial radiation. Warming and cooling depend on an imbalance of solar and terrestrial radiation. During the day, solar radiation exceeds terrestrial radiation and the surface becomes warmer. At night, solar radiation ceases, but terrestrial radiation continues and cools the surface. Cooling continues after sunrise until solar radiation again exceeds terrestrial radiation. Minimum temperature usually occurs after sunrise, sometimes as much as one hour after. The continued cooling after sunrise is one reason that fog sometimes forms shortly after the Sun is above the horizon. In addition to its daily rotation, the Earth revolves in a complete orbit around the Sun once each year. Since the axis of the Earth tilts to the plane of orbit, the angle of incident solar radiation varies seasonally between hemispheres. The Northern Hemisphere is warmer in June, July, and August because it receives more solar energy than the Southern Hemisphere. During December, January, and February, the opposite is true—the Southern Hemisphere receives more solar energy and is warmer. The shape of the Earth causes a geographical variation in the angle of incident solar radiation. Since the Earth is essentially spherical, the Sun is closer to being overhead in equatorial regions than at higher latitudes. Equatorial regions, therefore, receive the most radiant energy and are warmest. Slanting rays of the Sun at higher latitudes deliver less energy over a given area with the least being received at the poles. Thus, temperature varies with latitude from the warm equator to the cold poles. Not related to movement or shape of the Earth are temperature variations induced by water and terrain. Water absorbs and radiates energy with less temperature change than does land. Large, deep water bodies tend to minimize temperature changes, while continents favor large changes. Wet soil, such as in swamps and marshes, is almost as effective as water in suppressing temperature changes. Thick vegetation tends to control temperature changes since it contains some water and also insulates against heat transfer between the ground and the atmosphere. Arid, barren surfaces permit the greatest temperature changes. These topographical influences are both diurnal and seasonal. For example, the difference between a daily maximum and minimum may be 10°F or less over water, near a shoreline, or over a swamp or marsh, while a difference of 50°F or more is common over rocky or sandy deserts. In the Northern Hemisphere in July, temperatures are warmer over continents than over oceans; in January they are colder over continents than over oceans. The opposite is true in the Southern Hemisphere, but not as pronounced because of more water surface in the Southern Hemisphere. To compare land and water effect on seasonal temperature variation, consider northern Asia and southern California near San Diego. In the deep continental interior of northern Asia, July average temperature is about 50°F, and January average, about -30°F. Seasonal range is about 80°F. Near San Diego, due to the proximity of the Pacific Ocean, July average is about 70°F, and January average, about 50°F. Seasonal variation is only about 20°F. Prevailing wind is also a factor in temperature controls. In an area where prevailing winds are from large water bodies, temperature changes are rather small. Most islands enjoy fairly constant temperatures. On the other hand, temperature changes are more pronounced where prevailing wind is from dry, barren regions. The air slowly transfers heat from the surface upward. Thus, temperature changes aloft are more gradual than at the surface. Temperature normally decreases with increasing altitude throughout the troposphere. This decrease of temperature with altitude is defined as lapse rate. The average decrease of temperature—average lapse rate—in the troposphere is 3.6°F per 1,000 ft. But since this is an average, the exact value seldom exists. In fact, temperature sometimes increases with height through a layer. An increase in temperature with altitude is defined as an inversion, i.e., lapse rate is inverted. An inversion often develops near the ground on clear, cool nights when wind is light. The ground radiates and cools much faster than the overlying air. Air in contact with the ground becomes cold while the temperature a few hundred feet above changes very little. Thus, temperature increases with height. Inversions may also occur at any altitude when conditions are favorable. For example, a current of warm air aloft overrunning cold air near the surface produces an inversion aloft. Inversions are common in the stratosphere. Atmospheric pressure is the force per unit area exerted by the weight of the atmosphere. Since air is not solid, it cannot be weighed with conventional scales. Yet, Toricelli proved three centuries ago that he could weigh the atmosphere by balancing it against a column of mercury. He actually measured pressure by converting it directly to weight. The instrument Toricelli designed for measuring pressure is the barometer. Weather services and the aviation community use two types of barometers in measuring pressure—the mercurial and aneroid. 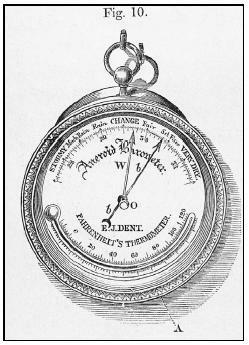 The mercurial barometer consists of an open dish of mercury that is placed into the open end of an evacuated glass tube. Atmospheric pressure forces mercury to rise in the tube. At stations near sea level, the column of mercury rises on the average to a height of 29.92 in. In other words, a column of mercury of that height weighs the same as a column of air having the same cross section as the column of mercury and extending from sea level to the top of the atmosphere. Why is mercury used in the barometer? Mercury is the heaviest substance available that remains liquid at ordinary temperatures. It permits the instrument to be of manageable size. Water could be used but at sea level the water column would be about 34 ft high. The aneroid consists of a partially evacuated metal cell that contracts and expands with changing pressure, and a coupling mechanism that drives the indicator along a scale graduated in pressure units. changes. One end of the cell is fixed, while the other end moves the registering mechanism. The coupling mechanism magnifies movement of the cell, driving an indicator hand along a scale graduated in pressure units. Pressure is expressed in many ways throughout the world. The term used depends somewhat on its application and the system of measurement. Two popular units are inches of mercury or millimeters of mercury. Since pressure is force per unit area, a more explicit expression of pressure is pounds per square inch (lb/in 2 ) or grams per square centimeter (g/cm 2 ). The term millibar (mb) precisely expresses pressure as a force per unit area, 1 mb being a force of 1,000 dynes per square centimeter. The millibar is rapidly becoming a universal pressure unit. Pressure can be measured only at the point of measurement. The pressure measured at a station or airport is station pressure or the actual pressure at field elevation. Pressure varies with altitude and temperature of the air as well as with other minor influences. Moving upward through the atmosphere, weight of the air above becomes less and less. Within the lower few thousand feet of the troposphere, pressure decreases roughly 1 in of mercury for each 1,000-ft increase in altitude. At sea level, the average pressure is about 14.7 lb/in 2 . It has been found that the pressure will decrease by half for each 18,000-ft increase in altitude. Thus, at 18,000 ft, we could expect an average pressure of about 7.4 lb/in 2 and at 36,000 ft, a pressure of only 3.7 lb/in 2 , and so on. Since pressure varies with altitude, it is not easy to compare station pressures between stations at different altitudes. To make them comparable, pressure readings must be adjusted to some common level. Mean sea level seems the most feasible common reference. Pressure measured at a 5,000-ft station is 25 in; pressure increases about 1 in for each 1,000 ft or a total of 5 in. Sea-level pressure is approximately 25 + 5, or 30 in. The weather observer takes temperature and other effects into account, but this simplified example explains the basic principle of sea-level pressure reduction. Sea-level pressure is usually expressed in millibars. Standard sea-level pressure is 1,013.2 mb, 29.9 in of mercury, or about 14.7 lb/in 2 . LOW —a center of pressure surrounded on all sides by higher pressure; also called a cyclone. Cyclonic curvature is the curvature of isobars to the left when you stand with lower pressure to your left. HIGH —a center of pressure surrounded on all sides by lower pressure, also called an anticyclone. Anticyclonic curvature is the curvature of isobars to the right when you stand with lower pressure to your left. TROUGH —an elongated area of low pressure with the lowest pressure along a line marking maximum cyclonic curvature. RIDGE —an elongated area of high pressure with the highest pressure along a line marking maximum anticyclonic curvature. COL —the neutral area between two highs and two lows. It is also the intersection of a trough and a ridge. The col on a pressure surface is analogous to a mountain pass on a topographic surface. We simply contour the heights of the pressure surface. For example, a 700-mb constant pressure analysis is a contour map of the heights of the 700-mb pressure surface. While the contour map is based on variations in height, these variations are small when compared to flight levels, and for all practical purposes, you may regard the 700-mb chart as a weather map at approximately 10,000 ft. Differences in temperature create differences in pressure. For example, local winds along lake and ocean shores are the result of the temperature differences between land and water, which cause a pressure difference and wind. These pressure differences drive a complex system of winds in a never-ending attempt to reach equilibrium. Wind also transports water vapor and spreads fog, clouds, and precipitation. When two surfaces are heated unequally, they heat the overlying air unevenly. The warmer air expands and becomes lighter or less dense than the cool air. The denser, cool air is drawn to the ground by its greater gravitational force lifting or forcing the warm air upward much as oil is forced to the top of water when the two are mixed. The rising air spreads and cools, eventually descending to complete the convective circulation. As long as the uneven heating persists, convection maintains a continuous convective current. The horizontal air flow in a convective current is wind. Convection of both large and small scales accounts for systems ranging from hemispheric circulations down to local eddies. This horizontal flow, wind, is sometimes called advection. However, the term advection more commonly applies to the transport of atmospheric properties by the wind, i.e., warm advection; cold advection; advection of water vapor, etc. Pressure differences must create a force in order to drive the wind. This force is the pressure gradient force. The force is from higher pressure to lower pressure and is perpendicular to isobars or contours. Whenever a pressure difference develops over an area, the pressure gradient force begins moving the air directly across the isobars. The closer the spacing of isobars, the stronger the pressure gradient force is. The stronger the pressure gradient force, the stronger the wind is. Thus, closely spaced isobars mean strong winds; widely spaced isobars mean lighter wind. From a pressure analysis, the reader can get a general idea of wind speed from contour or isobar spacing. Because of uneven heating of the Earth, surface pressure is low in warm equatorial regions and high in cold polar regions. A pressure gradient develops from the poles to the equator. If the Earth did not rotate, this pressure gradient force would be the only force acting on the wind. Circulation would be two giant hemispheric convective currents. Cold air would sink at the poles; wind would blow straight from the poles to the equator; warm air at the equator would be forced upward; and high-level winds would blow directly toward the poles. However, the Earth does rotate; and because of its rotation, this simple circulation is greatly distorted. A moving mass travels in a straight line until acted on by some outside force. However, if one views the moving mass from a rotating platform, the path of the moving mass relative to his platform appears to be deflected or curved. To illustrate, start rotating a potter's wheel. Then, using a piece of chalk and a ruler, draw a straight line from the center to the outer edge of the wheel. To you, the chalk traveled in a straight line. Now stop the turntable; on it, the line spirals outward from the center. To a viewer on the turntable, some apparent force deflected the chalk to the right. A similar apparent force deflects moving particles on the earth. Because the earth is spherical, the deflective force is much more complex than the simple turntable example. This principle was first explained by a Frenchman, Coriolis, and carries his name—the Coriolis force. The Coriolis force affects the paths of aircraft, missiles, flying birds, and ocean currents, and is most important to the study of weather and air currents. The force deflects air to the right in the Northern Hemisphere and to the left in the Southern Hemisphere. This text concentrates mostly on deflection to the right in the Northern Hemisphere. Coriolis force is at a right angle to wind direction and directly proportional to wind speed. That is, as wind speed increases, Coriolis force increases. At a given latitude, double the wind speed and you double the Coriolis force. Coriolis force varies with latitude from zero at the equator to a maximum at the poles. It influences wind direction everywhere except immediately at the equator, but the effects are more pronounced in middle and high latitudes. Remember that the pressure gradient force drives the wind and is perpendicular to isobars. When a pressure gradient force is first established, wind begins to blow from higher to lower pressure directly across the isobars. However, the instant air begins moving, Coriolis force deflects it to the right. Soon the wind is deflected a full 90° and is parallel to the isobars or contours. At this time, Coriolis force exactly balances pressure gradient force. With the forces in balance, wind will remain parallel to isobars or contours. Surface friction disrupts this balance; Coriolis force distorts the fictitious global circulation. As air is forced aloft at the equator and begins its high-level trek northward, the Coriolis force turns it to the right or to the east. Wind becomes westerly at about 30° latitude, temporarily blocking further northward movement. Similarly, as air over the poles begins its low-level journey southward toward the equator, it likewise is deflected to the right and becomes an east wind, halting for a while its southerly progress. As a result, air literally "piles up" at about 30° and 60° latitude in both hemispheres. The added weight of the air increases the pressure into semipermanent high-pressure belts. The building of these high-pressure belts creates a temporary impasse, disrupting the simple convective transfer between the equator and the poles. The restless atmosphere cannot live with this impasse in its effort to reach equilibrium. Something has to give. Huge masses of air begin overturning in middle latitudes to complete the exchange. Large masses of cold air break through the northern barrier, plunging southward toward the tropics. Large midlatitude storms develop between cold outbreaks and carry warm air northward. The result is a midlatitude band of migratory storms with ever-changing weather. Since pressure differences cause wind, seasonal pressure variations determine to a great extent the areas of these cold air outbreaks and midlatitude storms. But, seasonal pressure variations are largely due to seasonal temperature changes. It should be remembered that at the surface, warm temperatures to a great extent determine low pressure, and cold temperatures determine high pressure. It should also be recalled that seasonal temperature changes over continents are much greater than over oceans. During summer, warm continents tend to be areas of low pressure and the relatively cool oceans tend to be areas of high pressure. In winter, the reverse is true: there is high pressure over the cold continents and low pressure over the relatively warm oceans. The same pressure variations occur in the warm and cold seasons of the Southern Hemisphere, although the effect is not as pronounced because of the much larger water areas of the Southern Hemisphere. Cold outbreaks are strongest in the cold season and are predominantly from cold continental areas. Summer outbreaks are weaker and more likely to originate from cool water surfaces. Since these outbreaks are masses of cool, dense air, they characteristically are high-pressure areas. As the air tries to blow outward from the high pressure, it is deflected to the right by the Coriolis force. Thus, the wind around a high blows clockwise. The high pressure with its associated wind system is an anticyclone. The storms that develop between high-pressure systems are characterized by low pressure. As winds try to blow inward toward the center of low pressure, they also are deflected to the right. Thus, the wind around a low is counterclockwise. The low pressure and its wind system is a cyclone. The high-pressure belt at about 30° north latitude forces air outward at the surface to the north and to the south. The northbound air becomes entrained into the midlatitude storms. The southward moving air is again deflected by the Coriolis force, becoming the well-known subtropical northeast trade winds. In midlatitudes, high-level winds are predominantly from the west and are known as the prevailing westerlies. Polar easterlies dominate low-level circulation north of about 60° latitude. There are three major wind belts. Northeasterly trade winds carry tropical storms from east to west. The prevailing westerlies drive midlatitude storms generally from west to east. Few major storm systems develop in the comparatively small Arctic region; the chief influence of the polar easterlies is their contribution to the development of midlatitude storms. Wind flow patterns aloft follow isobars or contours where friction has little effect. However, friction is a significant factor near the surface. Friction between the wind and the terrain surface slows the wind. The rougher the terrain, the greater the frictional effect. Also, the stronger the wind speed, the greater the friction. One may not think of friction as a force, but it is a very real and effective force always acting opposite to wind direction. As frictional force slows the wind speed, Coriolis force decreases. However, friction does not affect pressure gradient force. Pressure gradient and Coriolis forces are no longer in balance. The stronger pressure gradient force turns the wind at an angle across the isobars toward lower pressure until the three forces balance. Frictional and Coriolis forces combine to just balance pressure gradient force. Surface wind spirals outward from high pressure into low pressure, crossing isobars at an angle. The angle of surface wind to isobars is about 10° over water, increasing with roughness of terrain. In mountainous regions, one often has difficulty relating surface wind to pressure gradient because of immense friction and also because of local terrain effects on pressure. Winds, on the average, increase with height throughout the troposphere, culminating in a maximum near the level of the tropopause. These maximum winds tend to be further concentrated in narrow bands. A jet stream, then, is a narrow band of strong winds meandering through the atmosphere at a level near the tropopause. Further discussion of the jet stream is taken up later in this text. Local terrain features such as mountains and shore lines also influence local winds and weather. In the daytime, air next to a mountain slope is heated by contact with the ground as it receives radiation from the sun. This air usually becomes warmer than air at the same altitude, but farther from the slope. Surrounding colder, denser air settles downward and forces the warmer air near the ground up the mountain slope. This wind is a valley wind, so called because the air is flowing up out of the valley. At night, the air in contact with the mountain slope is cooled by terrestrial radiation and becomes heavier than the surrounding air. It sinks along the slope, producing the mountain wind, which flows like water down the mountain slope. Mountain winds are usually stronger than valley winds, especially in winter. The mountain wind often continues down the more gentle slopes of canyons and valleys, and in such cases becomes drainage wind. It can become quite strong over some terrain conditions and in extreme cases can become hazardous when flowing through canyon restrictions. A katabatic wind is any wind blowing down an incline when the incline is influential in causing the wind. Thus, the mountain wind is a katabatic wind. Any katabatic wind originates because cold, heavy air spills down sloping terrain, displacing warmer, less dense air ahead of it. Air is heated and dried as it flows downslope. Sometimes the descending air becomes warmer than the air it replaces. Many katabatic winds recurring in local areas have been given colorful names to highlight their dramatic, local effect. Some of these are the Bora, a cold northerly wind blowing from the Alps to the Mediterranean coast; the chinook, a warm wind down the east slope of the Rocky Mountains often reaching hundreds of miles into the high plains; the Taku, a cold wind in Alaska blowing off the Taku glacier; and the Santa Ana, a warm wind descending from the Sierras into the Santa Ana Valley of California. Land surfaces warm and cool more rapidly than do water surfaces; therefore, land is warmer than the sea during the day; wind blows from the cool water to warm land—the sea breeze, so called because it blows from the sea. At night, the wind reverses, blows from cool land to warmer water, and creates a land breeze. Land and sea breezes develop only when the overall pressure gradient is weak. Wind with a stronger pressure gradient mixes the air so rapidly that local temperature and pressure gradients do not develop along the shoreline. Rubbing two objects against each other creates friction. If the objects are solid, no exchange of mass occurs between the two. However, if the objects are fluid currents, friction creates eddies along a common shallow mixing zone, and a mass transfer takes place in the shallow mixing layer. This zone of induced eddies and mixing is called a shear zone. 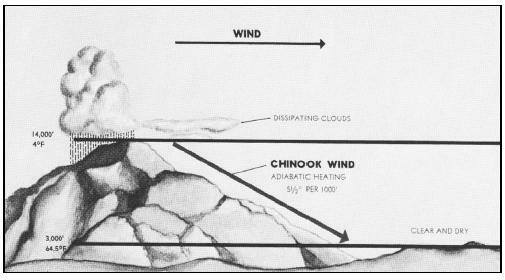 The "chinook" is a katabatic (downslope) wind. 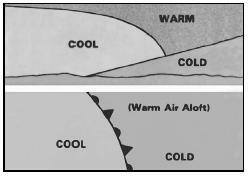 Air cools as it moves upslope and warms as it blows downslope. The chinook occasionally produces dramatic warming over the plains just east of the Rocky Mountains. wind speed at the surface will be less than aloft because of surface friction. Wind direction can be determined from a weather map. If you face along an isobar or contour with lower pressure on your left, wind will be blowing in the direction you are facing. On a surface map, wind will cross the isobar at an angle toward lower pressure; on an upper-air chart, it will be parallel to the contour. Wind blows counterclockwise (Northern Hemisphere) around a low, and clockwise around a high. At the surface where winds cross the isobars at an angle, the transport of air from high to low pressure can be seen. Although winds are virtually parallel to contours on an upper-air chart, there is still a slow transport of air from high to low pressure. At the surface when air converges into a low, it cannot go outward against the pressure gradient, nor can it go downward into the ground; it must go upward. Therefore, a low or trough is an area of rising air. Rising air is conducive to cloudiness and precipitation; thus we have the general association of low pressure—bad weather. By similar reasoning, air moving out of a high or ridge depletes the quantity of air. Highs and ridges, therefore, are areas of descending air. Descending air favors dissipation of cloudiness; hence the association, high pressure—good weather. Many times weather is more closely associated with an upper-air pattern than with features shown by the surface map. Although features on the two charts are related, they seldom are identical. A weak surface system often loses its identity in the upper-air pattern, while another system may be more evident on the upper-air chart than on the surface map. Widespread cloudiness and precipitation often develop in advance of an upper trough or low. A line of showers and thunderstorms is not uncommon with a trough aloft even though the surface pressure pattern shows little or no cause for the development. On the other hand, downward motion in a high or ridge places a "cap" on convection, preventing any upward motion. Air may become stagnant in a high, trap moisture and contamination in low levels, and restrict ceiling and visibility. Low stratus, fog, haze, and smoke are not uncommon in high-pressure areas. However, a high or ridge aloft with moderate surface winds most often produces good flying weather. Water evaporates into the air and becomes an everpresent but variable constituent of the atmosphere. Water vapor is invisible just as oxygen and other gases are invisible. However, water vapor can be readily measured and expressed in different ways. Two commonly used terms are relative humidity and dew point. Relative humidity routinely is expressed as a percentage. It relates the actual water vapor present to that which could be present. Temperature largely determines the maximum amount of water vapor air can hold. Warm air can hold more water vapor than cool air. Relative humidity expresses the degree of saturation. Air with 100% relative humidity is saturated; less than 100% is unsaturated. Dew point is the temperature to which air must be cooled to become saturated by the water vapor already present in the air. Aviation weather reports normally include the air temperature and dew-point temperature. Dew point when related to air temperature reveals qualitatively how close the air is to saturation. The difference between air temperature and dew-point temperature is popularly called the spread. As spread becomes less, relative humidity increases, and it is 100% when temperature and dew point are the same. Surface-temperature dew-point spread is important for anticipating fog, but has little bearing on precipitation. To support precipitation, air must be saturated through thick layers aloft. Sometimes the spread at ground level may be quite large, yet at higher altitudes the air is saturated and clouds form. Some rain may reach the ground or it may evaporate as it falls into the drier air. Our never-ending weather cycle involves a continual reversible change of water from one state to another. Evaporation, condensation, sublimation, freezing, and melting are changes of state. Evaporation is the changing of liquid water to invisible water vapor. Condensation is the reverse process. Sublimation is the changing of ice directly to water vapor, or water vapor to ice, bypassing the liquid state in each process. Snow or ice crystals result from the sublimation of water vapor directly to the solid state. Any change of state involves a heat transaction with no change in temperature. Evaporation requires heat energy that comes from the nearest available heat source. This heat energy is known as the latent heat of vaporization, and its removal cools the source it comes from. An example is the cooling of your body by evaporation of perspiration. What becomes of this heat energy used by evaporation? Energy cannot be created or destroyed, so it is hidden or stored in the invisible water vapor. When the water vapor condenses to liquid water or sublimates directly to ice, energy originally used in the evaporation reappears as heat and is released to the atmosphere. This energy is latent heat. Melting and freezing involve the exchange of "latent heat of fusion" in a similar manner. The latent heat of fusion is much less than that of condensation and evaporation; however, each in its own way plays an important role in weather. The atmosphere is never completely clean; an abundance of microscopic solid particles suspended in the air are condensation surfaces. These particles, such as salt, dust, and combustion by-products, are condensation nuclei. Some condensation nuclei have an affinity for water and can induce condensation or sublimation even when air is almost, but not completely, saturated. Freezing is complex and liquid water droplets often condense or persist at temperatures colder than 32°F. Water droplets colder than 32°F are supercooled. When they strike an exposed object, the impact induces freezing. For example, impact freezing of supercooled water can result in aircraft icing. Supercooled water drops are often in abundance in clouds at temperatures between 5°F and 32°F and, with decreasing amounts at colder temperatures. Usually, at temperatures colder than 5°F, sublimation is prevalent, and clouds and fog may be mostly ice crystals with a lesser amount of supercooled water. However, strong vertical currents may carry supercooled water to great heights where temperatures are much colder than 5°F. Supercooled water has been observed at temperatures colder than -40°F. During clear nights with little or no wind, vegetation often cools by radiation to a temperature at or below the dew point of the adjacent air. Moisture then collects on the leaves just as it does on a pitcher of ice water in a warm room. Heavy dew often collects on grass and plants while none collects on pavements or large solid objects. These more massive objects absorb abundant heat during the day, lose it slowly during the night, and cool below the dew point only in rather extreme cases. Three basic processes may cool air to saturation: (1) air moving over a colder surface, (2) stagnant air overlying a cooling surface, and (3) expansional cooling in upward moving air. Expansional cooling is the major cause of cloud formation. Precipitation is an all-inclusive term denoting drizzle, rain, snow, ice pellets, hail, and ice crystals. Precipitation occurs when these particles grow in size and weight until the atmosphere no longer can suspend them and they fall. These particles grow primarily in two ways. Cloud particles collide and merge into a larger drop in the more rapid growth process. This process produces larger precipitation particles and does so more rapidly than the simple condensation growth process. Upward currents enhance the growth rate and also support larger drops. Precipitation formed by merging drops with mild upward currents can produce light to moderate rain and snow. Strong upward currents support the largest drops and build clouds to great heights. They can produce heavy rain, heavy snow, and hail. Precipitation forming and remaining liquid falls as rain or drizzle. Sublimation forms snowflakes, and they reach the ground as snow if temperatures aloft remain below freezing. Precipitation can change its state as the temperature of its environment changes. Falling snow may melt in warmer layers of air at lower altitudes to form rain. Rain falling through colder air may become supercooled, freezing on impact as freezing rain; or it may freeze during its descent, failing as ice pellets. Ice pellets always indicate freezing rain at higher altitude. Sometimes strong upward currents sustain large super-cooled water drops until some freeze; subsequently, other drops freeze to them, forming hailstones. To produce significant precipitation, clouds usually are 4,000 ft thick or more. The heavier the precipitation, the thicker the clouds are likely to be. 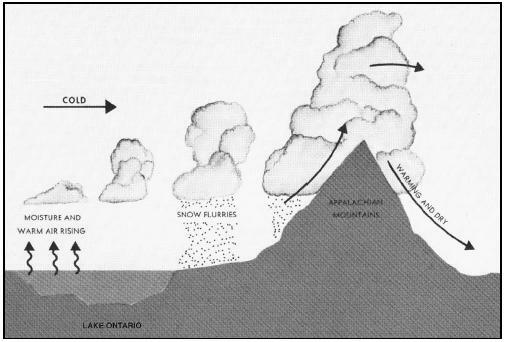 Land and water surfaces underlying the atmosphere greatly affect cloud and precipitation development. Large bodies of water such as oceans and large lakes add water vapor to the air. The greatest frequency of low ceilings, fog, and precipitation can be expected in areas where prevailing winds have an over-water trajectory. The aviator should be especially alert for these hazards when moist winds are blowing upslope. Strong cold winds across the Great Lakes absorb water vapor and may carry showers as far eastward as the Appalachians. In winter, cold air frequently moves over relatively warm lakes. The warm water adds heat and water vapor to the air, causing showers. In other seasons, the air may be warmer than the lakes. When this occurs, the air may become saturated by evaporation from the water while also becoming cooler in the low levels by contact with the cool water. Fog often becomes extensive and dense to the lee of a lake. Strong cold winds across the Great Lakes often carry precipitation to the Appalachians. A lake only a few miles across can influence convection and cause a diurnal fluctuation in cloudiness. During the day, cool air over the lake blows toward the land, and convective clouds form over the land. At night, the pattern reverses; clouds tend to form over the lake as cool air from the land flows over the lake, creating convective clouds over the water. Fog when temperature dew-point spread is 5°F or less and decreasing. Lifting or clearing of low clouds and fog when temperature dew-point spread is increasing. Frost on a clear night when temperature dew-point spread is 5°F or less, is decreasing, and dew point is colder than 32°F. More cloudiness, fog, and precipitation when wind blows from water than when it blows from land. Cloudiness, fog, and precipitation over higher terrain when moist winds are blowing uphill. Showers to the lee of a lake when air is cold and the lake is warm. Expect fog to the lee of the lake when the air is warm and the lake is cold. Clouds to be at least 4,000 ft thick when significant precipitation is reported. The heavier the precipitation, the thicker the clouds are likely to be. Any time air moves upward, it expands because of decreasing atmospheric pressure. Conversely, downward-moving air is compressed by increasing pressure. But as pressure and volume change, temperature also changes. When air expands, it cools; and when compressed, it warms. These changes are adiabatic, meaning that no heat is removed from or added to the air. We frequently use the terms expansional or adiabatic cooling and compressional or adiabatic heating. The adiabatic rate of change of temperature is virtually fixed in unsaturated air but varies in saturated air. Unsaturated air moving upward and downward cools and warms at about 5.4°F per 1,000 ft. This rate is the dry adiabatic rate of temperature change and is independent of the temperature of the mass of air through which the vertical movements occur. Condensation occurs when saturated air moves upward. Latent heat released through condensation partially offsets the expansional cooling. Therefore, the saturated adiabatic rate of cooling is slower than the dry adiabatic rate. The saturated rate depends on saturation temperature or dew point of the air. Condensation of copious moisture in saturated warm air releases more latent heat to offset expansional cooling than does the scant moisture in saturated cold air. Therefore, the saturated adiabatic rate of cooling is less in warm air than in cold air. When saturated air moves downward, it heats at the same rate as it cools on ascent, provided liquid water evaporates rapidly enough to maintain saturation. Minute water droplets evaporate at virtually this rate. Larger drops evaporate more slowly and complicate the moist adiabatic process in downward-moving air. Adiabatic warming of downward-moving air produces the warm chinook wind. If a sample of air is forced upward into the atmosphere, two possibilities must be considered: (1) the air may become colder than the surrounding air, or (2) even though it cools, the air may remain warmer than the surrounding air. If the upward-moving air becomes colder than surrounding air, it sinks; but if it remains warmer, it is accelerated upward as a convective current. Whether it sinks or rises depends on the ambient or existing temperature lapse rate. Existing lapse rate should not be confused with adiabatic rates of cooling in vertically moving air. Sometimes the dry and moist adiabatic rates of cooling will be called the dry adiabatic lapse rate and the moist adiabatic lapse rate. Lapse rate refers exclusively to the existing, or actual, decrease of temperature with height in a real atmosphere. The dry or moist adiabatic lapse rate signifies a prescribed rate of expansional cooling or compressional heating. An adiabatic lapse rate becomes real only when it becomes a condition brought about by vertically moving air. The difference between the existing lapse rate of a given mass of air and the adiabatic rates of cooling in upward-moving air determines if the air is stable or unstable. When air is cooling and first becomes saturated, condensation, or sublimation, begins to form clouds. Whether the air is stable or unstable within a layer largely determines cloud structure. Since stable air resists convection, clouds in stable air form in horizontal, sheet-like layers or strata. Thus, within a stable layer, clouds are stratiform. 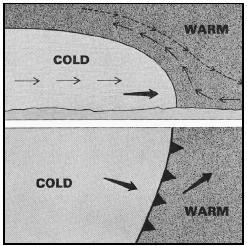 Adiabatic cooling may be by upslope flow; by lifting over cold, denser air; or by converging winds. Cooling by an underlying cold surface is a stabilizing process and may produce fog. If clouds are to remain stratiform, the layer must remain stable after condensation occurs. Unstable air favors convection. A cumulus cloud, meaning "heap," forms in a convective updraft and builds upward. Thus, within an unstable layer, clouds are cumuliform; and the vertical extent of the cloud depends on the depth of the unstable layer. Initial lifting to trigger a cumuliform cloud may be the same as that for lifting stable air. In addition, convection may be set off by surface heating. Air may be unstable or slightly stable before condensation occurs; but for convective cumuliform clouds to develop, it must be unstable after saturation. Cooling in the updraft is now at the slower moist adiabatic rate because of the release of latent heat of condensation. Temperature in the saturated updraft is warmer than ambient temperature, and convection is spontaneous. Updrafts accelerate until temperature within the cloud cools below the ambient temperature. This condition occurs when a stable layer, which is often marked by a temperature inversion, caps the unstable layer. Vertical heights range from the shallow fair weather cumulus to the giant thunderstorm cumulonimbus—the ultimate in atmospheric instability capped by the tropopause. When unstable air lies above stable air, convective currents aloft sometimes form middle- and high-level cumuliform clouds. 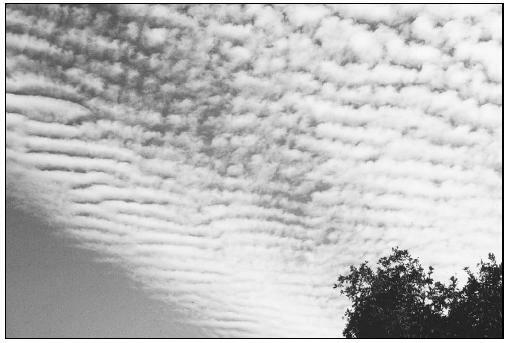 In relatively shallow layers they occur as altocumulus and ice crystal cirrocumulus clouds. Altocumulus castellans clouds develop in deeper midlevel unstable layers. The basic cloud types are divided into four families: high clouds, middle clouds, low clouds, and clouds with extensive vertical development. The first three families are further classified according to the way they are formed. Clouds formed by vertical currents in unstable air are cumulus, meaning accumulation or heap; they are characterized by their lumpy, billowy appearance. Clouds formed by the cooling of a stable layer are stratus, meaning stratified or layered; they are characterized by their uniform, sheet-like appearance. In addition to the above, the prefix nimbo- , and the suffix -nimbus , mean rain cloud. Thus, stratified clouds from which rain is falling are nimbostratus. A heavy, swelling cumulus-type cloud that produces precipitation is a cumulonimbus. Clouds broken into fragments are often identified by adding the suffix -fractus ; for example, fragmentary cumulus is cumulus fractus. The high-cloud family is cirriform and includes cirrus, cirrocumulus, and cirrostratus. They are composed almost entirely of ice crystals. The height of the bases of these clouds is in the range of 16,500–45,000 ft in middle latitudes. In the middle-cloud family are the altostratus, altocumulus, and nimbostratus clouds. These clouds are primarily water, much of which may be supercooled. The height of the bases of these clouds is in the range of 6,500–23,000 ft in middle latitudes. In the low-cloud family are the stratus, stratocumulus, and fair-weather cumulus clouds. Low clouds are almost entirely water, but at times the water may be supercooled. Low clouds at subfreezing temperatures can also contain snow and ice particles. The bases of these clouds range from near the surface to about 6,500 ft in middle latitudes. The vertically developed family of clouds includes towering cumulus and cumulonimbus. These clouds usually contain supercooled water above the freezing level. But when a cumulus grows to great heights, water in the upper part of the cloud freezes into ice crystals, forming a cumulonimbus. The heights of cumuliform cloud bases range from 1,000 ft or lower to above 10,000 ft.
Fog is a surface-based cloud composed of either water droplets or ice crystals. Small temperature dew-point spread is essential for fog to form. Therefore, fog is prevalent in coastal areas where moisture is abundant. However, fog can occur anywhere. Abundant condensation nuclei enhance the formation of fog. Thus, fog is prevalent in industrial areas where byproducts of combustion provide a high concentration of these nuclei. Fog occurs most frequently in the colder months, but the season and frequency of occurrence vary from one area to another. Fog may form either by cooling air to its dew point, or by adding moisture to air near the ground. Fog is classified by the way it forms. Formation may involve more than one process. Radiation fog is relatively shallow fog. It may be dense enough to hide the entire sky or may conceal only part of the sky. "Ground fog" is a form of radiation fog. Conditions favorable for radiation fog are clear sky, little or no wind, and small temperature dew-point spread (high relative humidity). The fog forms almost exclusively at night or near daybreak. Terrestrial radiation cools the ground; in turn, the cool ground cools the air in contact with it. When the air is cooled to its dew point, fog forms. When rain soaks the ground, followed by clearing skies, radiation fog is not uncommon the following morning. Radiation fog is restricted to land because water surfaces cool little from nighttime radiation. It is shallow when wind is calm. Winds up to about 5 knots mix the air slightly and tend to deepen the fog by spreading the cooling through a deeper layer. Stronger winds disperse the fog or mix the air through a still deeper layer with stratus clouds forming at the top of the mixing layer. Ground fog usually "burns off" rather rapidly after sunrise. Other radiation fog generally clears before noon unless clouds move in over the fog. Advection fog forms when moist air moves over colder ground or water. It is most common along coastal areas but often develops deep in continental areas. At sea it is called sea fog. Advection fog deepens as wind speed increases up to about 15 knots. Wind much stronger than 15 knots lifts the fog into a layer of low stratus or stratocumulus. The west coast of the United States is quite vulnerable to advection fog. This fog frequently forms offshore as a result of cold water and then is carried inland by the wind. During the winter, advection fog over the central and eastern United States results when moist air from the Gulf of Mexico spreads northward over cold ground. The fog may extend as far north as the Great Lakes. Water areas in northern latitudes have frequent dense sea fog in summer as a result of warm, moist, tropical air flowing northward over colder arctic waters. Advection fog is usually more extensive and much more persistent than radiation fog. Advection fog can move in rapidly regardless of the time of day or night. Upslope fog forms as a result of moist, stable air being cooled adiabatically as it moves up sloping terrain. Once the upslope wind ceases, the fog dissipates. Unlike radiation fog, it can form under cloudy skies. Upslope fog is common along the eastern slopes of the Rockies and somewhat less frequent east of the Appalachians. Upslope fog often is quite dense and extends to high altitudes. When relatively warm rain or drizzle falls through cool air, evaporation from the precipitation saturates the cool air and forms fog. Precipitation-induced fog can become quite dense and continue for an extended period of time. This fog may extend over large areas, completely suspending air operations. It is most commonly associated with warm fronts, but can occur with slow-moving cold fronts and with stationary fronts. Ice fog occurs in cold weather when the temperature is much below freezing and water vapor sublimates directly as ice crystals. Conditions favorable for its formation are the same as for radiation fog except that it is associated with cold temperatures, usually -25°F or colder. It occurs mostly in the arctic regions, but is not unknown in middle latitudes during the cold season. Stratus clouds, like fog, are composed of extremely small water droplets or ice crystals suspended in air. An observer on a mountain in a stratus layer would call it fog. Stratus and fog frequently exist together. In many cases there is no real line of distinction between the fog and stratus; rather, one gradually merges into the other. Stratus tends to be lowest during night and early morning, lifting or dissipating due to solar heating during the late morning or afternoon. Low stratus clouds often occur when moist air mixes with a colder air mass or in any situation where temperature dew-point spread is small. Haze is a concentration of salt particles or other dry particles not readily classified as dust or other phenomena. It occurs in stable air, is usually only a few thousand feet thick, but sometimes may extend as high as 15,000 ft. Haze layers often have definite tops above which horizontal visibility is good. However, downward visibility from above a haze layer is poor, especially on a slant. Visibility in haze varies greatly, depending upon whether the observer is facing the sun. Smoke concentrations form primarily in industrial areas when air is stable. It is most prevalent at night or early morning under a temperature inversion but it can persist throughout the day. When a body of air comes to rest or moves slowly over an extensive area having fairly uniform properties of temperature and moisture, the air takes on those properties. Thus, the air over the area becomes somewhat of an entity and has fairly uniform horizontal distribution of its properties. The area over which the air mass acquires its identifying distribution of moisture and temperature is its source region. Source regions are many and varied, but the best source regions for air masses are large snow- or ice-covered polar regions, cold northern oceans, tropical oceans, and large desert areas. Midlatitudes are poor source regions because transitional disturbances dominate these latitudes, giving little opportunity for air masses to stagnate and take on the properties of the underlying region. Just as an air mass takes on the properties of its source region, it tends to also take on properties of the underlying surface when it moves away from its source region, thus becoming modified. Cool air moving over a warm surface is heated from below, generating instability and increasing the possibility of showers. Warm air moving over a cool surface is cooled from below, increasing stability. If air is cooled to its dew point, stratus and/or fog forms. Evaporation from water surfaces and failing precipitation adds water vapor to the air. When the water is warmer than the air, evaporation can raise the dew point sufficiently to saturate the air and form stratus or fog. Water vapor is removed by condensation and precipitation. Stability of an air mass determines its typical weather characteristics. When one type of air mass overlies another, conditions change with height. Characteristics typical of an unstable air mass are: cumuliform clouds, showery precipitation, rough air (turbulence), and good visibility. Characteristics of stable air include: stratiform clouds and fog, continuous precipitation, smooth air, and fair-to-poor visibility in haze and smoke. As air masses move out of their source regions, they come in contact with other air masses of different properties. The zone between two different air masses is a frontal zone or front. Across this zone, temperature, humidity, and wind often change rapidly over short distances. When one passes through a front, the change from the properties of one air mass to those of the other is sometimes quite abrupt. Abrupt changes indicate a narrow frontal zone. At other times, the change of properties is very gradual, indicating a broad and diffuse frontal zone. Temperature —Temperature is one of the most easily recognized discontinuities across a front. At the surface, the passage of a front usually causes noticeable temperature change. Dew point —Dew-point temperature is a measure of the amount of water vapor in the air. Temperature dew-point spread is a measure of the degree of saturation. Dew point and temperature dew-point spread usually differ across a front. The difference helps identify the front and may give a clue to differences of cloudiness and/or fog. Wind —Wind always changes across a front. Wind discontinuity may be in direction, in speed, or in both. Pressure —A front lies in a pressure trough, and pressure generally is higher in the cold air. Thus, when a front is crossed directly into colder air, pressure usually rises abruptly. When a front is approached toward warm air, pressure generally falls until the front is crossed, and then remains steady or falls slightly in the warm air. However, pressure patterns vary widely across fronts. The three principal types of fronts are the cold front, the warm front, and the stationary front. The leading edge of an advancing cold air mass is a cold front. At the surface, cold air is overtaking and replacing warmer air. Cold fronts move at about the speed of the wind component perpendicular to the front just above the frictional layer. A shallow cold air mass or a slow-moving cold front may have a frontal slope more like a warm front. The edge of an advancing warm air mass is a warm front—warmer air is overtaking and replacing colder air. Since the cold air is denser than the warm air, the cold air hugs the ground. The warm air slides up and over the cold air and lacks direct push on the cold air. Thus, the cold air is slow to retreat in advance of the warm air. This slowness of the cold air to retreat produces a frontal slope that is more gradual than the cold frontal slope. Consequently, warm fronts on the surface are seldom as well marked as cold fronts, and they usually move about half as fast when the general wind flow is the same in each case. When neither air mass is replacing the other, the front is stationary. The opposing forces exerted by adjacent air masses of different densities are such that the frontal surface between them shows little or no movement. In such cases, the surface winds tend to blow parallel to the frontal zone. Slope of a stationary front is normally shallow, although it may be steep, depending on wind distribution and density difference. Frontal waves and cyclones (areas of low pressure) usually form on slow-moving cold fronts or on stationary fronts. The life cycle and movement of a cyclone is dictated to a great extent by the upper wind flow. In the initial condition of frontal wave development, the winds on both sides of the front are blowing parallel to the front. Small disturbances then may start a wavelike bend in the front. If this tendency persists and the wave increases in size, a cyclonic (counterclockwise) circulation develops. One section of the front begins to move as a warm front, while the section next to it begins to move as a cold front. This deformation is a frontal wave. Cross section of a warm front (top) with the weather map symbol (bottom). The symbol is a line with rounded barbs pointing in the direction of movement. On a color map, a red line represents the warm front. The slope of a warm front is generally more shallow than that of a cold front. Movement of a warm front, shown by the heavy black arrow, is slower than the wind in the warm air, represented by the thin solid arrows. The warm air gradually erodes the cold air. stronger, and the surface winds are now strong enough to move the fronts; the cold front moves faster than the warm front. When the cold front catches up with the warm front, the two of them occlude (close together). The result is an occluded front or, for brevity, an occlusion. This is the time of maximum intensity for the wave cyclone. Note that the symbol depicting the occlusion is a combination of the symbols for the warm and cold fronts. As the occlusion continues to grow in length, the cyclonic circulation diminishes in intensity and the frontal movement slows down. Sometimes a new frontal wave begins to form on the long westward-trailing portion of the cold front, or a secondary low-pressure system forms at the apex where the cold front and warm front come together to form the occlusion. In the final stage, the two fronts may have become a single stationary front again. The low center with its remnant of the occlusion is disappearing. Cross section of a cold front (top) with the weather map symbol (bottom). The symbol is a line with pointed barbs pointing in the direction of movement. On a color map, a blue line represents the cold front. The vertical scale is expanded in the top illustration to show the frontal slope, which is steep near the leading edge as cold air replaces warm air. Warm air may descend over the front as indicated by the dashed arrows; but more often, the cold air forces warm air upward over the frontal surface as shown by the solid arrows. lows over the western mountains are common as is the semistationary thermal low in the extreme southwestern United States. Tropical lows are also nonfrontal. As adjacent air masses modify and as temperature and pressure differences equalize across a front, the front dissipates. This process is frontolysis, the generation of a front. It occurs when a relatively sharp zone of transition develops over an area between two air masses that have densities gradually becoming more and more in contrast with each other. The necessary wind flow pattern develops at the same time. Weather occurring with a front depends on the amount of moisture available, the degree of stability of the air that is forced upward, the slope of the front, the speed of frontal movement, and the upper wind flow. Cross section of a warm-front occlusion (top) and its weather symbol (bottom). The symbol is a line with alternating pointed and rounded barbs on the same side of the line pointing in the direction of movement. On a color map, the line is purple. In the warm-front occlusion, air under the cold front is not as cold as air ahead of the warm front; and when the cold front overtakes the warm front, the cool air rides over the colder air. In a warm-front occlusion, cool air replaces cold air at the surface. Cross section of a cold-front occlusion. Its weather map symbol is the same as that for a warm-front occlusion, and the coldest air is under the cold front. When it overtakes the warm front, it lifts the warm front aloft, and cold air replaces cool air at the surface. tongue of moist air from the Gulf of Mexico over the Plains states. Thunderstorms may build rapidly. The degree of stability of the lifted air determines whether cloudiness will be predominately stratiform or cumuliform. If the warm air overriding the front is stable, stratiform clouds develop. If the warm air is unstable, cumuliform clouds develop. Precipitation from stratiform clouds is usually steady and there is little or no turbulence. Precipitation from cumuliform clouds is of a shower type and the clouds are turbulent. A cold front underrunning warm, moist, stable air. Clouds are stratified and precipitation is continuous. Precipitation induces stratus in the cold air. A cold front underrunning warm, moist, unstable air. Clouds are cumuliform with possible showers or thunderstorms near the surface position of the front. Convective clouds often develop in the warm air ahead of the front. The warm, wet ground behind the front generates low-level convection and fair-weather cumulus in the cold air. A slow-moving cold front underrunning warm, moist, unstable air. Clouds are stratified with embedded cumulonimbus and thunderstorms. This type of frontal weather is especially hazardous for aircraft, since the individual thunderstorms are hidden and cannot be avoided unless the aircraft is equipped with airborne radar. A fast-moving cold front underrunning warm, moist, unstable air. Showers and thunderstorms develop along the surface position of the front. A warm front with overrunning moist, stable air. Clouds are stratiform and widespread over the shallow front. Precipitation is continuous and induces widespread stratus in the cold air. A warm front with overrunning warm, moist, unstable air. A cold-front occlusion lifting warm, moist, stable air. Associated weather encompasses that associated with both warm and cold fronts when air is moist and stable. A warm-front occlusion lifting warm, moist, unstable air. The associated weather is complex and encompasses all types of weather related to both the warm and cold fronts when air is moist and unstable. Shallow frontal surfaces tend to have extensive cloudiness with large precipitation areas. Widespread precipitation associated with a gradual sloping front often causes low stratus and fog. In this case, the rain raises the humidity of the cold air to saturation. This and related effects may produce low ceiling and poor visibility over thousands of square miles. 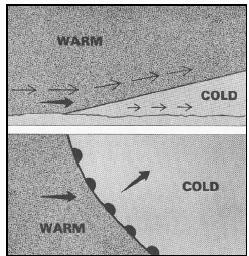 If temperature of the cold air near the surface is below freezing but the warmer air aloft is above freezing, precipitation falls as freezing rain or ice pellets; however, if temperature of the warmer air aloft is well below freezing, precipitation forms as snow. When the warm air overriding a shallow front is moist and unstable, the usual widespread cloud mass forms; but embedded in the cloud mass are altocumulus, cumulus, and even thunderstorms. These embedded storms are more common with warm and stationary fronts but may occur with a slow-moving, shallow cold front. A fast-moving, steep cold front forces upward motion of the warm air along its leading edge. If the warm air is moist, precipitation occurs immediately along the surface position of the front. Since an occluded front develops when a cold front overtakes a warm front, weather with an occluded front is a combination of both warm and cold frontal weather. A front may have little or no cloudiness associated with it. Dry fronts occur when the warm air aloft is flowing down the frontal slope or the air is so dry that any cloudiness that occurs is at high levels. The upper wind flow dictates to a great extent the amount of cloudiness and rain accompanying a frontal system as well as movement of the front itself. Systems tend to move with the upper winds. When winds aloft blow across a front, it tends to move with the wind. When winds aloft parallel a front, the front moves slowly, if at all. A deep, slow-moving trough aloft forms extensive cloudiness and precipitation, while a rapid-moving minor trough more often restricts weather to a rather narrow band. However, the latter often breeds severe, fast-moving, turbulent spring weather. An instability line is a narrow, nonfrontal line or band of convective activity. If the activity is fully developed in a thunderstorm, the line is a squall line. Instability lines form in moist, unstable air. An instability line may develop far from any front. More often, it develops ahead of a cold front, and sometimes a series of these lines move out ahead of the front. A favored location for instability lines which frequently erupt into severe thunderstorms is a dew-point front or dry line. During a considerable part of the year, dew-point fronts are common in western Texas and New Mexico northward over the Plains states. Moist air flowing north from the Gulf of Mexico abuts the dryer, and therefore slightly denser, air flowing from the southwest. Except for moisture differences, there is seldom any significant air mass contrast across this front, and therefore, it is commonly called a dry line. Nighttime and early morning fog and low-level clouds often prevail on the moist side of the line while generally clear skies mark the dry side. In spring and early summer over Texas, Oklahoma, and Kansas, and for some distance eastward, the dry line is a favored spawning area for squall lines and tornadoes. Convective currents are localized vertical air movements, both ascending and descending. For every rising current, there is a compensating downward current. The downward currents frequently occur over broader areas than do the upward currents, and therefore, they have a slower vertical speed than do the rising currents. Convective currents are most active on warm summer afternoons when winds are light. Heated air at the surface creates a shallow, unstable layer, and the warm air is forced upward. Convection increases in strength and to greater heights as surface heating increases. Barren surfaces such as sandy or rocky wastelands and plowed fields become hotter than open water or ground covered by vegetation. Thus, air at and near the surface heats unevenly. Because of uneven heating, the strength of convective currents can vary considerably within short distances. When cold air moves over a warm surface, it becomes unstable in lower levels. Convective currents extend several thousand feet above the surface, resulting in rough, choppy turbulence. This condition often occurs in any season after the passage of a cold front. The tropopause is a thin layer forming the boundary between the troposphere and stratosphere. Height of the tropopause varies from about 65,000 ft over the equator to 20,000 ft or lower over the poles. The tropopause is not continuous but generally descends step-wise from the equator to the poles. These steps occur as breaks. An abrupt change in temperature lapse rate characterizes the tropopause. Maximum winds generally occur at levels near the tropopause. These strong winds create narrow zones of wind shear that often generate hazardous turbulence for aircraft. The jet stream is a narrow, shallow, meandering river of maximum winds extending around the globe in a wavelike pattern. A second jet stream is not uncommon, and three at one time are not unknown. A jet may be as far south as the northern tropics. A jet in midlatitudes generally is stronger than one in or near the tropics. The jet stream typically occurs in a break in the tropopause. Therefore, a jet stream occurs in an area of intensified temperature gradients characteristic of the break. The concentrated winds, by arbitrary definition, must be 50 knots or greater to classify as a jet stream. The jet maximum is not constant; rather, it is broken into segments, shaped something like a boomerang. Jet stream segments move with pressure ridges and troughs in the upper atmosphere. In general, they travel faster than pressure systems, and maximum wind speed varies as the segments progress through the systems. In midlatitude, wind speed in the jet stream averages considerably stronger in winter than in summer. Also, the jet shifts farther south in winter than in summer. A condensation trail, or contrail, is generally defined as a cloudlike streamer that frequently is generated in the wake of aircraft flying in clear, cold, humid air. Two distinct types are observed—exhaust trails and aerodynamic trails. The exhaust contrail is formed by the addition to the atmosphere of sufficient water vapor from aircraft exhaust gases to cause saturation or super-saturation of the air. Since heat is also added to the atmosphere in the wake of an aircraft, the addition of water vapor must be of such magnitude that it saturates or supersaturates the atmosphere in spite of the added heat. There is evidence to support the idea that the nuclei, which are necessary for condensation or sublimation, may also be donated to the atmosphere in the exhaust gases of aircraft engines, further aiding contrail formation. These nuclei are relatively large. However, recent experiments have found that by adding very minute nuclei material (dust, for example) to the exhaust visible exhaust contrails could be prevented. Condensation and sublimation on these smaller nuclei result in contrail particles too small to be visible. In air that is almost saturated, aerodynamic pressure reduction around airfoils, engine nacelles, and propellers cools the air to saturation, leaving condensation trails from these components. This type of trail usually is neither as dense nor as persistent as exhaust trails. However, under critical atmospheric conditions, an aerodynamic contrail may trigger the formation and spreading of a deck of cirrus clouds. Air travels in a corkscrew path around the jet core with upward motion on the equatorial side. Therefore, when high-level moisture is available, cirriform clouds form on the equatorial side of the jet. Jet stream cloudiness can form independently of well-defined pressure systems. Such cloudiness ranges primarily from scattered to broken coverage in shallow layers or streaks. Their sometimes fishhook and streamlined, wind-swept appearance always indicates very strong upper wind usually quite far from developing or intense weather systems. The most dense cirriform clouds occur with well-defined systems. They appear in broad bands. Cloudiness is rather dense in an upper trough, thickens downstream, and becomes most dense at the crest of the downwind ridge. The clouds taper off after passing the ridge crest, in the area of descending air. The poleward boundary of the cirrus band often is quite abrupt and frequently casts a shadow on lower clouds, especially in an occluded frontal system. The upper limit of dense, banded cirrus is near the tropopause; a band may be either a single layer of multiple layers 10,000–12,000 ft thick. Dense, jet stream cirriform cloudiness is most prevalent along midlatitude and polar jets. However, a cirrus band usually forms along the subtropical jet in winter, when a deep upper trough plunges southward into the tropics. An important aspect of the jet stream cirrus shield is its association with turbulence. Extensive cirrus cloudiness often occurs with deepening surface and upper lows and these deepening systems produce the greatest turbulence. why can you see your breath on a cold morning? does the air temperature have to be below freezing for this to occur? Good Job! This website really helped me with my project. Keep up the good work! Very Good. It has given me information for me to think about the problem why snow and hail come as a mixture at the same time. RELATIVE HUMIDITY DOES NOT TELL US HOW MUCH WATER IS ACTUALLY IN THE AIR RATHER IT TELLS US HOW CLOSE THE AIR IS TO BEING SATURATED. I'm not completely sure, but I think the author of this study uses the word "sublimation" several times when he/she really mean "deposition." My understanding is that solid to gas state change is called sublimation, while gas to solid state change is called deposition. I was wondering, which 30 day period exibits the lagest seasonal temperature change, on average, each year? i would like to find out the influence of major factors which act as a driving force behind temperature inversion? THIS ARTICLE HAS HELPED ME ALOT. BUT MAY YOU HELP ME ON THIS QUESTION,What are the effects of atmospheric instability and stability on weather phenomenon? What is the name of the term for the phenomenon of temperature change that occurs approximately one hour before sunrise? i would like to ask one question,what are the consequences of vertically lifting of moisture in the atmospher? The document that you prepared is so nice to understand easily. What is the normal activity of southern hemisphere air and northern hemisphere air where they meet at the equator. Suppose something really bad contaminated the southern hemisphere air. How long would it take until the northern hemisphere air was just as bad as the southern air?? If it is cold and windy and a warm front moves in what will the weather be like? What keeps the majority of air & particles in the troposphere from crossing into the stratosphere? I have one question. In winter if the SST in Icelandic region is colder that means the Icelandic Low is weaker? Or put together otherwise, what an influence has the SST anomaly on pressure centers (Icelandic Low, Azoric High? does the air flow rate(higher/lower) affecting the time for the fog to be clear on the inner side of the glass in close cabinet?if affecting the time, which one will make the fog to be clear faster?higher or lower? What are the methods to measure Vertical Temperature Gradient. I mean how to take the temperature readings? Is there any instrument available? Yes ladies and gentlemen.My question is Regions of high pressure consist of low temperature and vice versa but from ideal gas equation; PV=nRT ie pressure is directly proportional to temperature while other factors are kept constant.Now why this concept is violeted under that condition? Does cold temperature at lower pressure or high altitude have less effect on humans than at sea level or higher pressure? That is, is it harder to insulate yourself against the cold when the air is denser? Why do I only wear the same clothes skiing in -20 degrees Celsius in Canada that I wear in Australia at -2 degrees? Is it related to air density? I really need to know the Processes that determined the stability and instability in the troposphere alone, rather not atmosphere as a whole. I am trying to find out what the sparkley "diamonds" in the air are called that you see on clear, bright, sunny days. There is a particular word that I heard on a PBS presentation showing the sparkles you see. Can you help me?